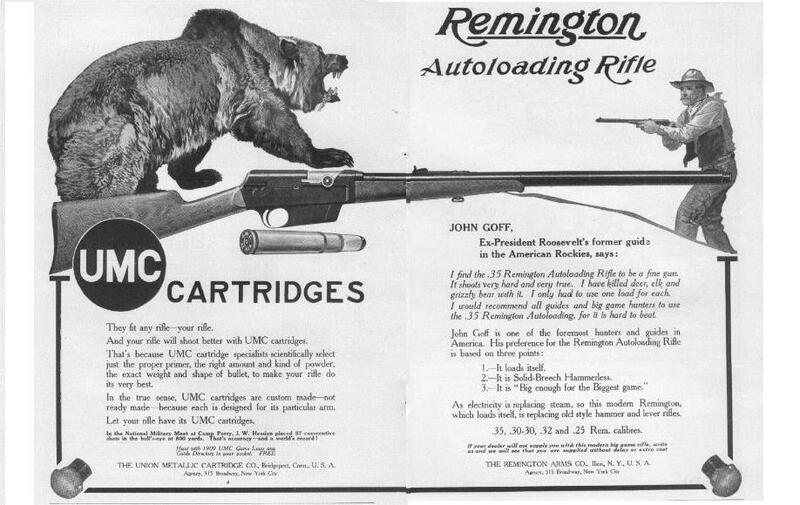 Remington was not the first American manufacturer to introduce a center-fire semi-automatic rifle. 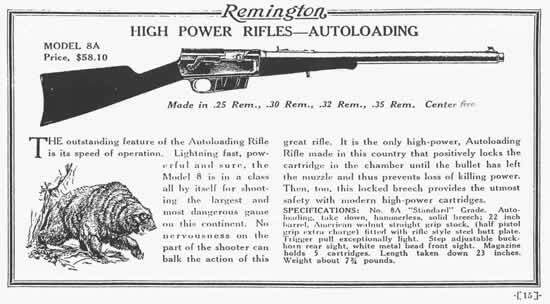 But the gun that became the Remington Model 8 was a fully realized semi-automatic rifle capable of reliably cycling powerful center-fire cartridges. Originally introduced as the Remington Autoloading Rifle in 1906, (and its European counter part the FN 1900 which wasn’t produced until 1910 by Fabrique Nationale) the name was changed to the Remington Model 8 in 1911, even though the rifle itself was essentially unchanged. The saying goes “no two model 8’s are the same” as the rifles were subject to many small cosmetic and engineering changes over the course of production. Designed by John Moses Browning while he was working on his first semi-automatic shotgun, eventually the Browning Auto-5; the new rifle used the same long-stroke recoil operating system as his new shotgun. It had a 22” jacketed barrel, five-round fixed box magazine that could be filled by means of five-round stripper clips (for the 25, 30, 32 Remington and four rounds for the 35 Remington) just like military rifles of the day. Additionally, four unique rounds for the Model 8 were introduced…first it was chambered in 35 Remington, followed by the 30 Remington in 1907 (called the 30-30 Remington initially) then the 32 Remington and the 25 Remington (called the 25-35 Remington initially) were developed for the Remington Model 8. This rifle is recognized as the first mass-produced, American, semi-automatic rifle chambered for a round more powerful than the most popular deer cartridge of the day, the .30-30 Win. Remington was not shy about using the unique power of its semi-automatic rifle as a selling point. 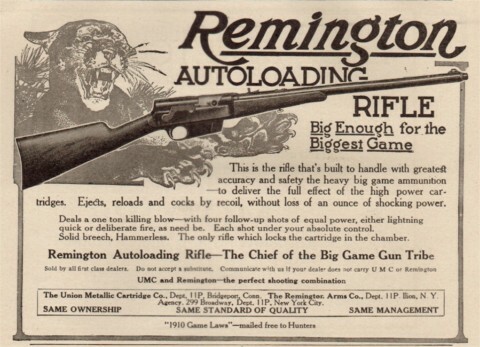 Remington ads from 1907 touted the ability of a Remington Autoloading Rifle in .35 Rem. to pierce a 5/16″ steel plate. Promotional artwork portrayed outdoorsmen face to face with bear, wolves and other dangerous animals. Remington’s message was clear; the Model 8 is a gun you can rely on in close-quarters life or death situations. During the 1930s, both large and small manufacturers were forced to cease production of a number of interesting, unique and desirable firearms. Several firearm manufacturers went under as well, but DuPont’s purchase of Remington in 1934 provided re-energized leadership and an infusion of capital and that kept Remington afloat through those hard times. The Model 8 survived thanks to a timely redesign that streamlined production and lowered costs. Remington also added a thicker wrist and fore-end to better absorb the gun’s stout recoil. The new gun, dubbed the Model 81 “ Woodsmaster”, debuted in 1936. All in all the Remington Model 8 has stood the test of time. They are still carried in the field every year hunting in the year 21st century; 100+ years after John Browning first patented it. So what has made this rifle so popular? Is it the rifle itself or the quest for the past that keeps this one hundred and three year old rifle in the woods? Or is that good ideas never loose their usefulness? Everyone has their reason for the love of their Model 8 and everyone has a story why they love these great old work horses of the woods. Whatever the reason these rifles have weathered 100+ years of use and have been preserved in the memories of men, in deer camps , books, pictures, and art and will be remembered as one of the greatest rifles ever designed. Glory to God in all things.